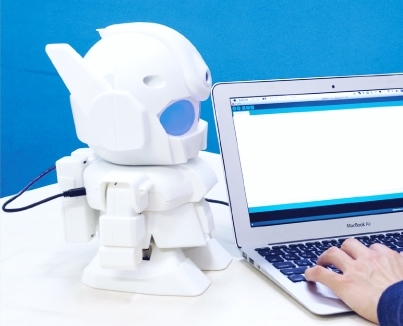 Rapiro is the very cute programmable robot that can be powered by Pi. And you can buy him here! 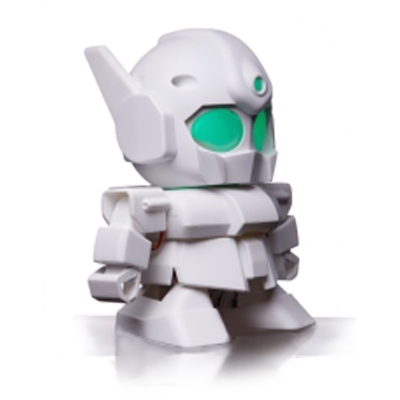 Don't forget, Rapiro does also comes with a pre-programmed board, so he will work straight out of the box without a Raspberry Pi, as he comes with a pre-programmed Rapiro board. 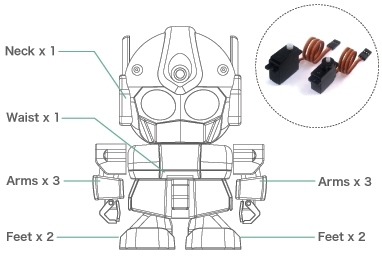 This is also Arduino compatible, so you can program him using the Arduino IDE. Easy to assemble - RAPIRO really is very easy to assemble. All you need to build him is two screwdrivers, and to follow the simple step-by-step instructions. Works immediately - Not a programmer? Not a problem! 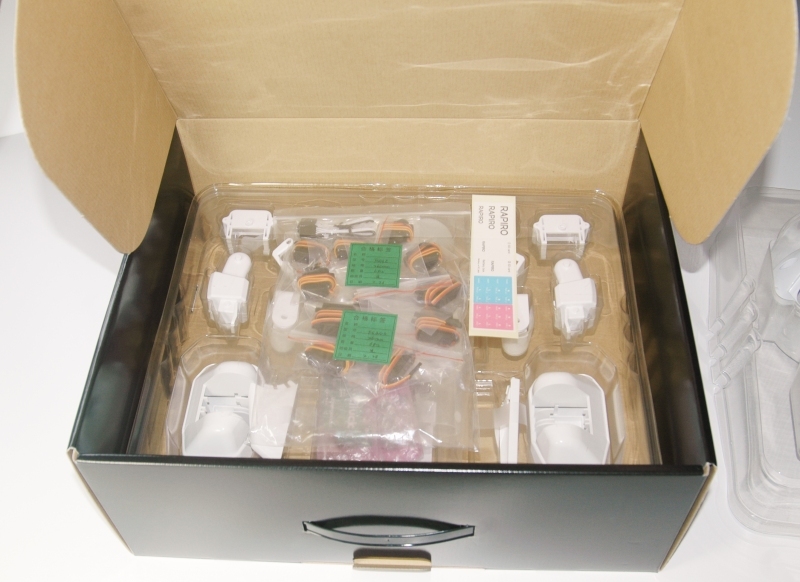 RAPIRO comes with a pre-programmed RAPIRO board which works right after assembling. Customizable - RAPIRO has countless possibilities for expansion and using him with a Raspberry Pi means lots of opportunities to programme. By mounting a Raspberry Pi and sensors (sold separately), you can customize your RAPIRO anyway you want. 12 servo motors - RAPIRO comes with a total of 12 servo motors, one in the neck, one at the waist, two in each foot, and three in each arm. Check RAPIRO out on this video! RAPIRO comes with a total of 12 servo motors, one for his neck, one at the waist, two in each foot, and three in each arm. The six servos in Rapiro's neck, waist and feet have a torque of 2.5kgf-cm(35ozf-in), whilst the six servos in Rapiro's arms have a torque of 1.5kgf-cm(21ozf-in). He has operating speeds of 0.12 sec/60° and maximum angles of 180°. For those who want a higher level of control (or just want to give your Pi a fun job to do), you can mount a Raspberry Pi (sold separately) inside RAPIRO. The Raspberry Pi can be programmed with a wide variety of languages being used on ARM Linux. 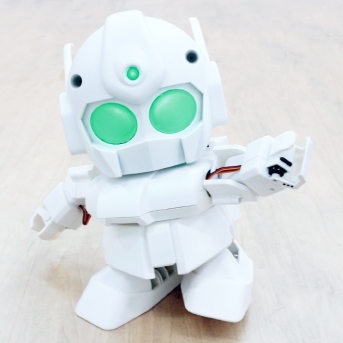 Depending on how you programme him, your RAPIRO could give you message notifications if he is wifi enabled, or he could even protect your home as a security robot using a Raspberry Pi Camera Module. The Cost of Shipping will depend which part of the world it is going to - and is calculated at checkout. The most articulated Pi Robot on the market. Will really extend your programming ability. 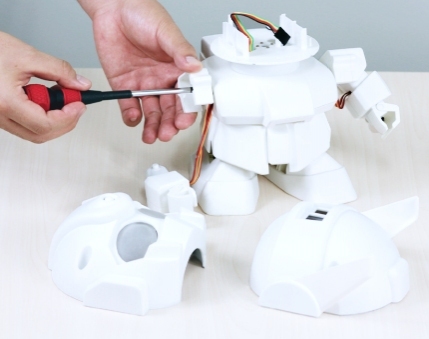 Rapiro works out of the box, or with the Arduino or Raspberry Pi. He gives you lots of flexibility in terms of learning experience. He is great for class projects, as students can each write programmes and run them on Rapiro.